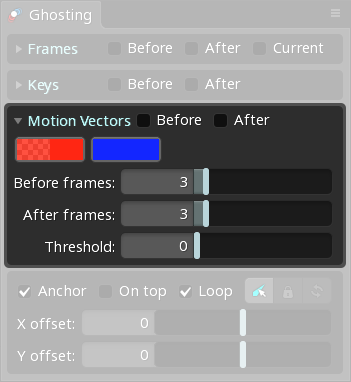 The Ghosting view contains settings for displaying skeleton "ghosts", also known as "onion skinning". Ghosting allows skeleton poses from preceding or subsequent timeline positions to be seen at the same time. These poses can then be considered when making decisions about the current pose. The Frames section controls ghosts that are shown for preceding or subsequent frames. When Before is checked, ghosts are shown for preceding frames. When After is checked, ghosts are shown for subsequent frames. The Before frames and After frames sliders control how far behind and ahead to draw ghosts. The Frame step slider sets how often a ghost is draw for these frames. Fractional values may be typed into any of the slider text boxes. For example, with After frames set to 6 and Frame step set to 3, two ghost poses will be drawn: one 3 frames ahead of the current frame and one 6 frames ahead of the current frame. 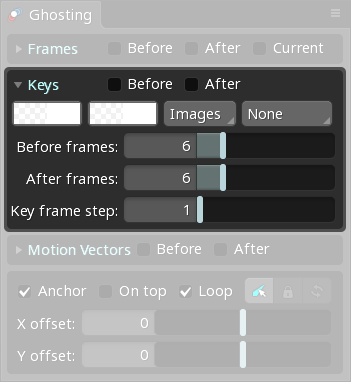 The Key Frames section is identical to the Frames section, except ghosts are only shown for frames that have a key set. For example, with After frames set to 6 and Key frame step set to 1, a ghost will be drawn for all frames that have a key within the next 6 frames. 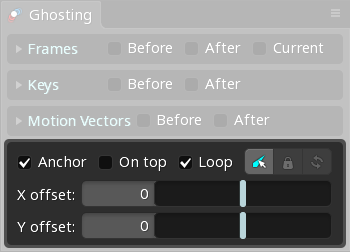 The Motion Vectors section enables you to draw motion lines for mesh and region attachments. Motion vectors display how much, and in which direction, vertices move over time and can be helpful to visualize speed. 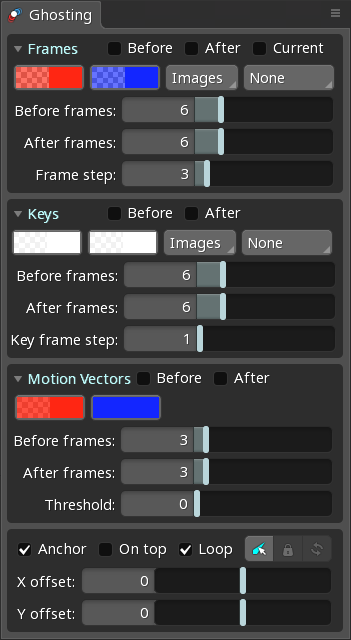 For example if Before Frames is set to 6, we can see how far a vertex moves in those 6 frames. If Before Frames is set to 1, we can see how far a vertex moves in 1 frame. The Threshold setting will hide motion vectors smaller than the threshold, if set to 0, all motion vectors will be drawn. The color settings are identical to the Frames section. The left color button sets the color to tint ghosts from preceding frames. The right color button sets the color to tint ghosts from subsequent frames. White causes the ghosts to be rendered without tint. None No attachments are displayed. Images Attachment images are rendered normally. Solid Attachment images are rendered using a solid color. This setting can use significant GPU resources when many ghosts are displayed. None No outlines are displayed. Silhouette The entire ghost is outlined. This setting can use significant GPU resources when many ghosts are displayed. Xray Each attachment is outlined. This setting can use significant GPU resources when many ghosts are displayed. When On top is checked, the ghosts are drawn on top of the skeleton. 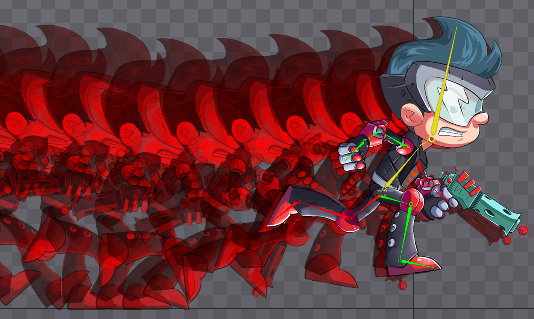 When Loop is checked and Repeat is enabled for the timeline, ghosts will be shown past the start and end of the animation. The X offset and Y offset sliders control the drawing position of the ghosts on the X and Y axes, which has a number of uses. An offset can make it easier to see the ghosts, otherwise they can be difficult to see when drawn on top of each other and on top of or behind the skeleton. The offset can be used to simulate the speed the skeleton will be moving at runtime. The offset is defined as pixels per frame. 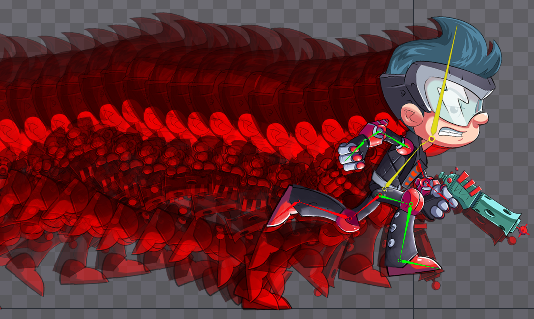 Spine uses 30 frames per second, so the speed the skeleton will be moving at runtime can easily be converted to pixels per frame. 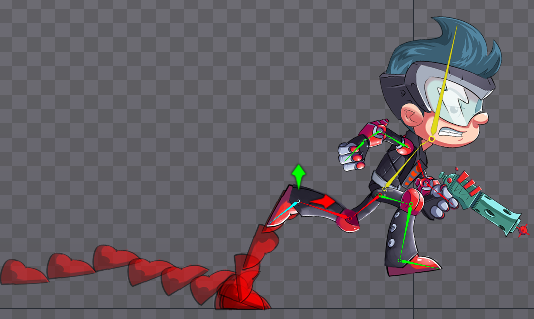 Once the ghosts have an X offset that matches the skeleton speed at runtime, for a running or walking animation the ghosts will show if the feet are sliding. The animation matches the X offset perfectly when all of the ghost's feet land in the same position. If the feet will slide at runtime, the ghost's feet will not land in the same position. In this case, the animation needs to be scaled slower or faster to match the X offset, or the X offset needs to be adjusted to match the animation. Y offset can be used in a similar way, for example for a character that jumps. 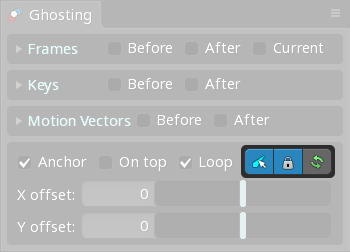 When Anchor is enabled, the ghosts aren't animating and it can be easier to see how the skeleton is animating. This is especially true when Frame step is greater than 1. Anchor only affects Frames ghosts. Key Frames ghosts are always anchored. When Anchor is unchecked, ghosts are drawn relative to the current frame. This means the ghosts animate as the skeleton does, they are just shifted in time. When offset is used, the ghosts are always drawn a fixed distance from the skeleton. For example, if Anchor is unchecked, Frame step is 3, Before frames is 6, and the current timeline position is frame 10.5, then ghosts are drawn using frames 7.5 and 4.5. 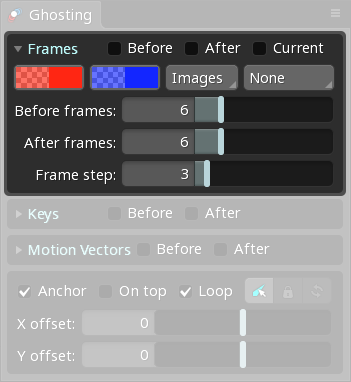 When anchor is checked, ghosts are drawn at fixed intervals starting from frame 0. This means the ghosts don't animate as the skeleton does. When offset is used, the distance the ghosts are drawn from the skeleton shows how much time until the skeleton matches the ghosts' pose. For example, if Anchor is checked, Frame step is 3 then ghosts will only ever be drawn at frames 0, 3, 6, 9, 12, etc. This means if Before frames is 6 and the current timeline position is frame 10.5 then ghosts are drawn at frame 9 and 6. Ghosting can be configured to only show ghosts for attachments of the selected bones by clicking the Bones button. The Lock button prevents the ghosted bones from changing and the Refresh button updated the ghosted bones to the current selection. If no bones are selected, all attachments are shown.